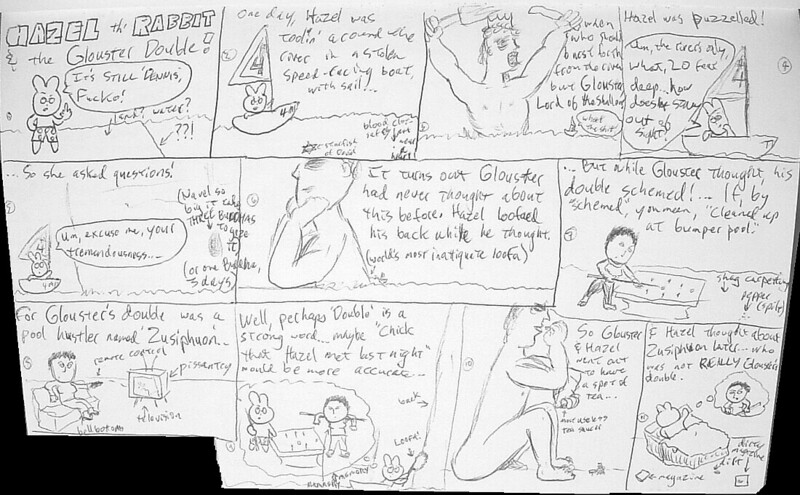 page 3: the Glouster Double! when who should burst forth from the river but Glouster, Lord of the Shallow! Hazel: "Um, the river's only, what, 20 feet deep..how does he stay out of sight?" Hazel: "Um, excuse me, your tremendousness..."
It turns out Glouster had never thought about this before. Hazel loofaed his back while he thought. ...But while Glouster thought, his double schemed!...If, by "schemed", you mean, "cleaned up at bumper pool." for Glouster's double was a pool hustler named 'Zusiphuon'..
& Hazel thought about Zusiphuon later...who was not REALLY Glouster's double.